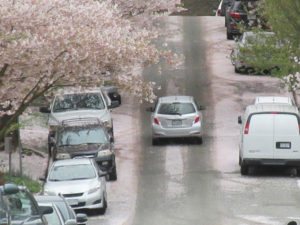 On 6th avenue, if you head towards Slocan you’ll get a view of this beautiful cherry blossom road. On top of the hill the canopy of cherry trees is spectacular. It’s a short block, but the cherry trees are quite amazing. There are large Akebono cherry trees, which means a lot of petals are falling. This is the last week to get caught in Akebono snow, so hurry up and check our neighbourhood map to locate cherry trees trees near you.